Recent years have seen a large and growing population of skilled young professionals working in relatively new fields like IT-ITES specifically ITES or business process outsourcing (BPO) industries. These fields demand odd working hours and frequent shift changes. The effect of these on normal functioning of human body is a field that is often ignored. Recent NASSCOM survey indicates that around 4.5 million employees are working in BPO and related sectors. Sixty-five percent of the employees in BPO industry are males. Long working hours, erratic timings, long travel time, work pressure, and insufficient breaks have always been the factors causing stress among the BPO employees. Any average BPO employee puts in 11-12 hours of work per day and at times it reaches 14 hours in case of companies that encourage overtime. IT professionals face continuous stress due to job deadlines supplemented by environmental and domestic stressors. Stress results from an imbalance between resources and demands including self imposed ones. During stressful situations, concentration, awareness on posture, dexterity during work, and many neurophysiological changes occur in the body leading to drop in work performance. Adverse effects on learning and memory, following intense stress have repeatedly been found. India being the forerunner in the cyber world, there is an urgent need to understand the dynamics of computer-related health problems and prevent it from assuming epidemic proportions. The bulk of literature available on this problem is in the west with very few studies done in an Indian setup. The present study is aimed at evaluating the cognitive functions of the male BPO employees, the influence of shift work on memory and speed performances. The present study was conducted on employees of various BPOs of Bangalore city. The study was approved by Institutional Ethical Committee. Informed written consent was obtained from every subject after explaining the study protocol. Subjects in the age group of 25-35 yrs who were on compulsory rotating night shifts were selected for the study. BPO employees who had a minimum work experience of 6 months in the field and working on computers for at least 5 h per day or 25 h per week were considered for the study. Subjects with good physical and mental health were chosen after obtaining a detailed history and doing relevant clinical examination. Individuals with history of pre-existing conditions like diabetes, hypertension, and sleep disorders, those who were on medication for any illness and smokers were excluded from the study. Fifty male BPO employees selected from various BPOs across Bangalore formed the study group. They were compared with 50 age-matched individuals working in non-BPO sectors and did not have any night shifts who formed the controls. Mean age of study subjects was 29.14 ± 2.96 years and that of controls was 28.52 ± 2.77 years. All the subjects were assessed for cognitive functions at the end of their work. The Digit Symbol Substitution Test  is a test of visuomotor coordination, motor persistence, sustained attention, and response speed. Rapid information processing is required in order to substitute the symbols accurately and quickly. The test consists of a sheet in which numbers 1-9 are randomly arranged in four rows of 25 squares each. The subject substitutes each number with a symbol using a number-symbol key given on top of the page. The first 10 squares are for practice. The time taken to complete the test forms the score. The Digit Vigilance Test  consists of numbers 1-9 randomly ordered and placed in rows on a page. There are 30 digits per row and 50 rows on the sheet. The digits are closely packed on the sheet. The same level of mental effort or attention deployment is required over a period of time. The subject has to focus on the target digits 6 and 9 among other distracter digits and has to cancel the digits as fast as possible without missing the targets or cancelling wrong numbers. Inability to sustain and focus attention levels leads to both increased time to complete the test as well as errors. The time taken to complete the test forms the score. The Rey's Auditory Verbal Learning test  consists of words designating familiar objects like the vehicles, tools, animals, and body parts. There are two lists A and B, with 15 words in each list. Words in list A were presented at the rate of one word per second during three successive trials. The words were presented in the same order in every trial. Each trial consisted of the presentation of all 15 words, immediately followed by the recall of the same. In each trial, after the presentation, the subject was asked to recall the words but no cues were given. The response was noted down. After the completion of all trials of List A, words in List B were presented once and an immediate recall was taken for the same. The presentation of List B serves as interference and prevents the subject from recalling words from List A subsequently from immediate memory. This was followed by immediate recall of words from List A. After a delay of 20 min words from List A were again recalled to form the delayed recall score. Following delayed recall, recognition of the words in list A was tested. The words in List A were randomly mixed with 15 new words. The new words were either phonemically or semantically similar to words in List A. The words were called out one at a time and the subject indicated whether each word belonged to list A or not. Hits and errors were recorded. The number of words correctly recalled in each of the three trials of List A as well as the total number of words recalled over all the three trials, form the learning score. The number of words recalled correctly in the immediate recall trial, delayed recall trial, and the recognition trial form the memory score. In the recognition trial, the hits are scored separately. The color names Blue, Green, Red, and Yellow are printed in capital letters on a paper. The color of the print occasionally corresponds with the color designated by the word. The words are printed in 16 rows and 11 columns. The stimulus sheet was placed in front of the subject. The subject was asked to read the stimuli column-wise as fast as possible. The time taken to read all the 11 columns was noted down. Next, the subject was asked to name the color in which the word was printed. The time taken to name all the colors in column wise was noted down. The reading time and the naming time were converted into seconds. The reading time was subtracted from the naming time to get the Stroop effect score. The 1 back and the 2 back versions of the N back test  were used. The 1 back version requires verbal storage and rehearsal, while the 2 back version requires in addition to the above, manipulation of the information. Therefore, the 1 back version would involve the articulatory loop in the verbal modality and the visuospatial sketchpad in the visual modality. The 2 back version would involve the central executive in both modalities. Thirty random ordered consonants were presented auditorily at the rate of 1 per second. Nine of the 30 consonants were repeated. The consonants, which were repeated, were randomly chosen. In the 1 back test the subject responds whenever a consonant was repeated consecutively. In the 2 back test the subject responds whenever a consonant is repeated after an intervening consonant. The number of hits and errors forms the scores in each test. Visual Working Memory was tested using N back test with 1 back and 2 back versions. It consisted of 36 cards each of which had one black dot placed randomly along a circle imagined to be on the card. The dimensions and location of the imaginary circle on each card remained constant in all cards. Each card was individually presented to the subject. The subject was told to respond whenever the location of the dot repeated itself. In the 1 back test, the subject was told to respond when the location of the dots was consecutively repeated and in the 2 back test was told to respond whenever the location of the dot was repeated after one intervening card. The number of hits and errors in each test formed the score. The data was analyzed using t-test and Mann-Whitney test. The difference was considered statistically significant whenever P ≤ 0.05. SPSS V.13.0 was used for analysis of data. Results of present study show a significant difference between BPO employees and controls in majority of the cognitive function tests performed [Table 1]. BPO employees performed poorly when compared to their controls in digit symbol substitution test, auditory verbal learning test, and stroop tests. However, no statistically significant difference was observed in digit vigilance test and verbal and visual N back tests. BPO employees performed poorly when compared to their controls in majority of the cognitive function tests administered in the present study. 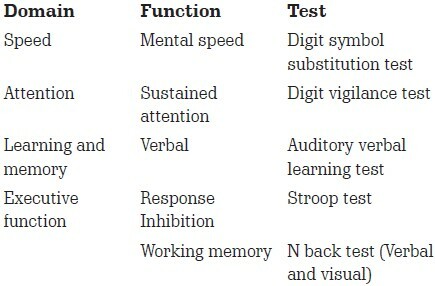 In tests for mental speed assessed using Digit symbol substitution test, our findings are consistent with previous studies which have shown decrease in cognitive efficiency associated with shift work. , Sleep deprivation in night shift workers is known to affect memory and performance speed. , Several studies have shown that increased stress has adverse effects on learning and memory. , BPO employees are exposed to frequent changes in shift and highly stressful working environment. This dual effect may be responsible for decreased cognitive functions seen in BPO employees. Results of the present study are similar to studies which have found no difference in attention and working memory between sleep deprived and non-sleep-deprived subjects. ,, Performance on the Wisconsin card screening test, a measure of frontal lobe function also remained the same. However, few studies have shown a decrease in attention and working memory due to sleep deprivation. In the tests measuring attention, two aspects of performance are important-speed and accuracy. Subjects usually switch their emphasis between the two. Concentrating on one often causes deterioration of the other. The speed/accuracy phenomenon is moderately affected by gender, age, and individual differences in response style, which could be a reason for inconsistencies in the sleep deprivation results. Attention is linked to the functioning of frontal lobes and frontal brain areas are vulnerable to sleep deprivation. It is also suggested that speed processes are rapidly affected by shift work while verbal memory processes would be impaired after several years of exposure. Similarly, our study shows no significant difference in the scores of verbal N back test between the groups. Response inhibition measures the ease with which a perceptual set can be shifted in accordance with changing demands as well as by suppressing a habitual response in favor of an unusual one. Prefrontal areas are essential for response inhibition. The response inhibition was tested by using Stroop Test. BPO employees performed poorly compared to their control group. This decreased response in BPO employees may be attributed to impairment of cognitive performance that depend on prefrontal cortex as discussed earlier. In conclusion, BPO employees recorded lower scores in tests of speed, learning and memory, and response inhibition. This decreased performance is possibly due to the nature of their work involving long working hours, shift changes, pressure to meet deadlines, and monotonous work. Also sleep deprivation, excessive stress, and fatigue negatively affect cognition. All these factors would have contributed to a decrease in cognitive performance among the BPO employees. BPO companies should focus toward improving the working environment by reducing the number of working hours of employee, recruiting more employees to cope with the demand, provide good working environment, and providing assistance of counselors in case of need. Management, occupational health advisors, supervisors, or shift employees themselves should be actively involved in reducing the risks associated with shift work. Each organization should seek the best compromise between the demands of the organization and the needs of the employees. Employees should be involved in the analysis, planning, and design stage of the shifts. There should be specific health and safety legislation on shift working. Reducing the risks associated with shift work and fatigue can improve the health and safety of employees. It also financially benefits the organization and society in general by reducing sickness, injuries and accidents, and by increasing work efficiency. Present study has compared BPO employees with non-BPO employees. Comparison with BPO employees not working in shifts will throw more light on role of stress in impaired cognitive functions. This study has been done only in males. Females who constitute 35% of BPO work force are not included in the study. Since changes seen in cognitive functions are different in both sexes, further studies are required including females as study subjects. 1. Rouch I, Wild P, Ansiau D, Marquie JC. Shift work experience, age and cognitive performance. Ergonomics 2005;48:1282-93. 2. Costa G. The impact of shift and night work on health. Appl Ergon 1996;27:9-16. 3. Elovainio M, Ferrie JE, Singh-Manoux A, Gimeno D, De Vogli R, Shipley MJ, et al. Cumulative exposure to high-strain and active jobs as predictors of cognitive function: The Whitehall II study. Occup Environ Med 2009;66:32-7. 4. Rao SL, Subbakrishna DK, Gopukumar K. NIMHANS neuropsychology Battery; 2004. 5. Wechsler D. Manual for the Wechsler adult intelligence scale-revised. New York: Psychological Corporation; 1981. 6. Lezak MD. Neuropsychological Assessment. 3 rd ed. New York: Oxford University Press; 1995. 7. Schmidt M. Rey auditory verbal learning test. A hand book. Los Angles, Western Psychological services; 1996. 8. Smith EE, Jonides J. Storage and executive processes in the frontal lobes. Science 1999;283:1657-61. 9. Chang YS, Wu YH, Hsu CY, Tang SH, Yang LL, Su SF. Impairment of perceptual and motor abilities at the end of a night shift is greater in nurses working fast rotating shifts. Sleep Med 2011;12:866-9. 10. Valdez, Ramirez, Garcia, Talamentis, Armijo, Borani. Circadian rhythms in components of attention. Biol Rhythm Res 2005;36:56-65. 11. Saricaoglu F, Ackinci SB, Gozacan A, Guner B, Rezaki M, Aypar U. The Effect of Day and Night Shift Working on the Attention and Anxiety Levels of Anesthesia Residents. Turk Psikiyatri Derg 2005;16:2. 12. McGaugh JL, Roozendaal B. Role of adrenal stress hormones in forming lasting memories in the brain. Curr Opin Neurobiol 2002;22:108-24. 13. De Kloet ER, Oitzl MS, Joels M. Stress and cognition. Are corticosteroids good or bad guys? Trends Neurosci 1999;22:422-6. 14. Forest G, Godbout R. Effects of sleep deprivation on performance and EEG spectral analysis in young adults. Brain Cogn 2000;43:195-200. 15. Drummond SP, Brown GG. The effects of total sleep deprivation on cerebral responses to cognitive performance. Neuropsychopharmacology 2001;25:S68-73. 16. Alhola P, Tallus M, Kylmälä M, Portin R, Polo-kantola P. Sleep deprivation, cognitive performance, and hormone therapy in postmenopausal women. Menopause 2005;12:149-55. 17. Binks PG, Waters WF, Hurry M. Short term total sleep deprivations does not selectively impair higher cortical functioning. Sleep 1999;22:328-34. 18. Alhola P, Polo-kantola P. Sleep deprivation: Impact on cognitive performance. Neuropsychiatr Dis Treat 2007;3:553-67. 19. Durmer JS, Dinges DF. Neurocognitive Consequences of Sleep Deprivation. Semin Neurol 2005;25:1. 20. Scoville WB, Milner B. Loss of recent memory after bilateral hippocampal lesions. J Neuropsychiatry Clin Neurosci 2000;12:103-13. 21. Hwang DY, Golby AJ. The brain basis for episodic memory: Insights from functional MRI, intracranial EEG, and patients with epilepsy. Epilepsy Behav 2006;8:115-26. 22. Thomas M, Sing H, Belenky G, Holcomb H, Mayberg H, Dannals R. Neural basis of alertness and cognitive performance impairments during sleepiness. I. Effects of 24 h of sleep deprivation on waking human regional brain activity. J Sleep Res 2000;9:335-52.